Can a princess be a firefighter? Well, of course she can! That was my first reaction. But I remember a time when little girls were not encouraged to follow their dreams. I remember growing up and seeing women be mostly moms. But as I grew up I also saw a shift. I saw women breaking into careers and I saw women being more than stay at home moms on television. It was great! Now, I’m raising strong, resilient, intelligent little girl and I tell her every day she can be whatever she wants to be. When I read Can a Princess Be a Firefighter to my daughter her first response was YES! I’m so glad she has that mentality because I can tell you when I was 6 I thought you could only be one or another. In, Can a Princess Be a Firefighter we see two little girls playing dress up at home and asking their dad “Can a princess be a firefighter?” He responds with listing off various professions while the girls dress up and act them out. He encourages them to be whatever they want to be. But my favorite part of the book is at the end when he tells the girls they can even be TWO! Sometimes I think we forget to teach our children you can have more than one passion. I try to demonstrate this to my daughter every day. During the day I work in an accounting firm, the rest of the time I’m a mom, writer and many other titles. How do I do it? I love it all! If you are doing what you truly love it doesn’t seem like work. Can a Princess Be a Firefighter stresses, no matter what you do make sure you like your job. Make sure you are happy. That is some wonderful advice! If you hate your job it’ll make you unhappy and everything and everyone around you will feel the negative impact. But if you like your job, enjoy what you do then you’ll be happy to get up and go to work. And you life will feel the positive impact. 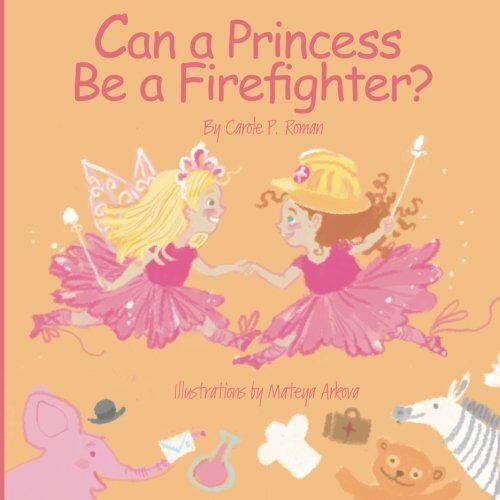 You can purchase a copy of Can a Princess Be a Firefighter? by Carole P Roman on Amazon or your local bookstore.